The first three renewable energy projects under the $50 million UAE-Caribbean Renewable Energy Fund (UAE-CREF) have broken ground in the Bahamas, Barbados and Saint Vincent and the Grenadines, the UAE Ministry of Foreign Affairs and International Cooperation (MOFAIC) announced today. Fully financed by the Abu Dhabi Fund for Development (ADFD), the UAE-CREF is the largest renewable energy initiative of its kind in the Caribbean, representing a partnership between MOFAIC, ADFD, and Masdar (Abu Dhabi Future Energy Company), the project manager and implementing lead. The three projects, designed by Masdar with the respective national governments, are set to come online by the first quarter (Q1) of 2019. In the wake of hurricanes Irma and Maria, the projects are also being built to elevate storm standards and are located in less exposed areas. “Through strategically partnering with Small Island Developing States, a group of small island countries that share similar development challenges, ADFD will help them achieve sustainable energy solutions that enhance their climate resilience and the economic prospects of the local communities. These projects in the Bahamas, Barbados and Saint Vincent & the Grenadines will have a significant positive knock-on effect on the adoption of renewable energy elsewhere in the Caribbean and Latin American region,” Al Suwaidi added. In the Bahamas, a 900-kilowatt solar PV plant at the national stadium will also serve as a carport with electric vehicle (EV) charging stations. As the country’s first large-scale solar energy project, it sets a regulatory precedent for new renewable energy plants to feed into the grid. In Barbados, the project has two elements: a 350-kilowatt solar PV carport also with EV charging stations, and a 500-kilowatt ground-mounted PV plant. Both projects are being built in partnership with the Barbados Water Authority. In Saint Vincent & the Grenadines, the project sets a strong precedent for using renewable energy to drive down energy costs on its outer islands. 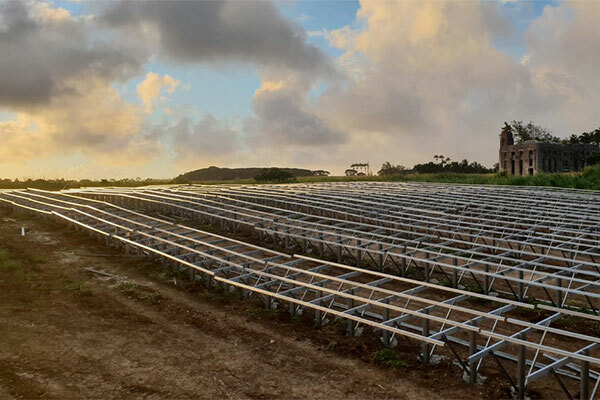 Under construction on Union Island, the 600-kilowatt solar PV plant is connected to a 500-kilowatt-hour lithium-ion battery and is expected to supply all of the island’s daytime power needs. Union Island’s energy costs are currently almost 50 per cent higher than those of the main island of Saint Vincent. The combined output of the solar power plants will be 2.35 megawatts (MW). Collectively, they will achieve diesel savings of more than 895,000 litres per year while displacing more than 2.6 million tonnes of carbon dioxide annually. This represents an annual diesel fuel saving of at least US$1.1 million. One of the additional aims of the Fund is to promote local capacity building, including training and employment opportunities, with a view to promoting gender equality. The projects’ manager and lead engineer are both women, and women will represent at least a third (30 per cent) of the staff employed by the (EPC) contractors responsible for the new renewable energy projects. “Masdar is proud to be working alongside the Ministry of Foreign Affairs and International Cooperation and the Abu Dhabi Fund for Development in the implementation of the UAE-Caribbean Renewable Energy Fund programme, building on the success of a similar collaboration in the Pacific Islands whose 11 projects continue to benefit local communities today,” said Mohamed Jameel Al Ramahi, chief executive officer of Masdar. “As a global renewable energy company active in more than 20 countries, with projects ranging from utility-scale power plants to off-grid and remote-area installations, Masdar is honoured to leverage its experience and expertise in collaboration with those of its partners in the UAE-Caribbean Renewable Energy Fund,” Al Ramahi added. The UAE-CREF aims to deploy renewable energy projects in 16 Caribbean countries over the next three years to help reduce reliance on fossil fuel imports, stimulate economic activity and enhance climate change resilience.